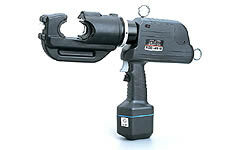 REC-4510 Battery Operated Tools: Izumi Products. The REC-4510 is a battery operated 12 ton compression tool to accommodate 12 ton shell type dies widely used in the industry. 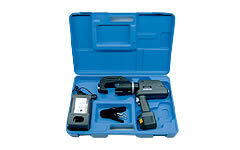 Pistol type 12 ton tool makes it easier for working in a tight space or in the control box. New rapid advance hydraulic mechanism is incorporated in the Four Thousand series pistol type tools and a built-in, preset bypass cartridge will kick in when the output reaches to 12 ton. The trigger switch and return button are activated only by one hand so that the other hand is always free to hold working material. This tool was designed to accommodate shell type dies for applying compression fittings to copper aluminium and ACSR conductors.